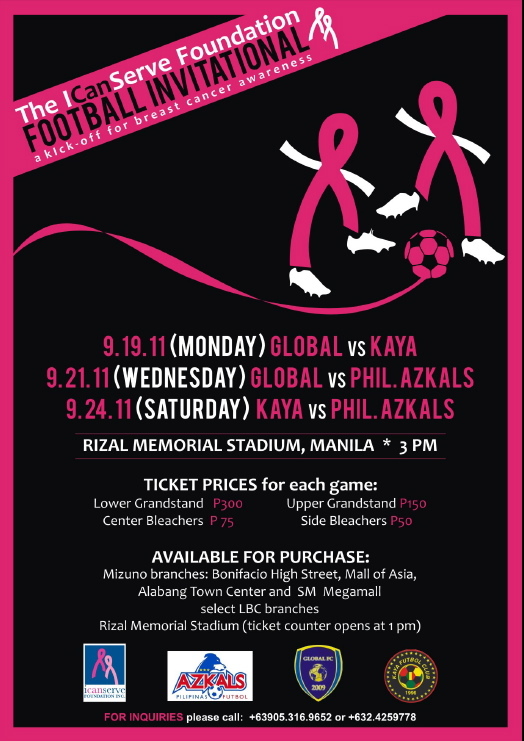 Kick breast cancer goodbye at the ICanServe Invitational, a charity football tournament featuring the Philippine Azkals and top United Football League clubs Global Futbol Club and Kaya Futbol Club. Slated on September 19 to 24 at the Rizal Memorial Stadium, the tournament is a single round format with Azkals like Aty Borromeo Anton del Rosario Jason Sabio Nate Burkey of Kaya and Misagh Bahadoran of Global playing for their respective clubs when they face the national team. Proceeds of the tournament will benefit the ICanServe Foundation, a non profit organization that promotes early breast cancer detection through community-based screening and high-impact information campaigns. Match sked: KayaFC vs GlobalFC on Monday (September 19); GlobalFC vs Azkals on Wednesday (September 21); Azkals vs KayaFC on Saturday (September 24). All matches will have 3 p.m. kickoff times and will be aired at 5 p.m. on the same day on AKTV Channel 13, the sports channel of TV5. Buy your tickets at LBC outlets and Mizuno Alabang Town Center, Trinoma, Mall of Asia, High Street and Megamall. Ticket prices: P50 for fight and left bleachers; P75 for middle bleachers; P150 for upper grandstand; P300 for lower grandstand. First 1,000 fans get free bleacher tickets, sponsored by LBC and SunLife. KayaFC managing director Armand del Rosario said the team in October will be wearing a limited edition shirt adorned with a pink ribbon, the international symbol for breast cancer awareness and support. October is breast cancer awareness month.